... 1968. Wife Sarah and I moved to a rural part of Fort Bragg, California in 2000 to enjoy our retirement. I am an avid reader of arcane books, have an eclectic collection of nearly 10,000 pieces of music and am a train nut - I love real ones and all types of model ones. I am the Mendocino Coast Model Railroad & Historical Society's historian and with enormous help from my friend Roger Thornburn (the blog's webmaster) have compiled a history of the railroads that operated along the Mendocino Coast - you can find it at Mendorailhistory.com. My torso reveals my other love - food and chocolate. I am blessed with four great kids with whom I have had great adventures. I have, alas, grown old but definitely have not grown up. If you have any comments or complaints about this blog please address them to me, Tony Phillips (philt95437@comcast.net). The responsibility for everything herein is mine. Although the road signs say “Elk” officially it is the Elk Post Office at Greenwood. 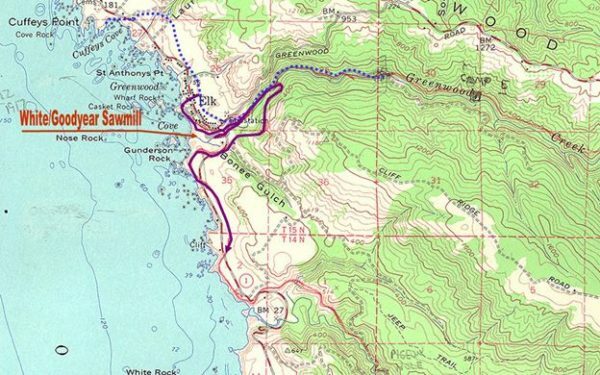 The reason for the strange appellation is that when postal codes were introduced there was another Greenwood in California so the name was sort of changed to avoid confusion. A century ago the population was 10 times as large as today’s. Schooners from the L.E. White Lumber Co. (LEWLCo) sailed regularly from San Francisco and early tourists took the 14 hour ride for $5, dinner and bunk included. 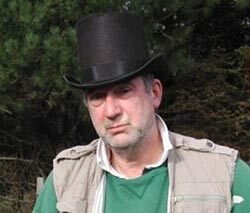 The town had ten hotels each with a saloon and there five other saloons. Each of the ethnic groups which worked in the mill: Finns, Swedes, Irish, Russians and Chinese congregated in “their” saloon. The L.E. White offices are still in Elk. Today the offices are the local museum and the museum contains a cornucopia of logging operations artifacts and exhibits. The area around the museum was the lumber drying yard. 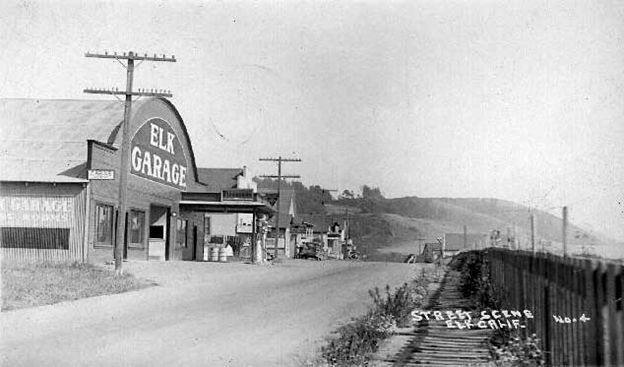 The garage in Elk today was there when the mill was in operation – as were the buildings to the south in this picture taken in 1901. The building with the rounded roof in the picture is the garage. Opposite the garage there is a path that goes down to the sea. It all looks so peaceful now. A hundred years ago it was a hive of activity. 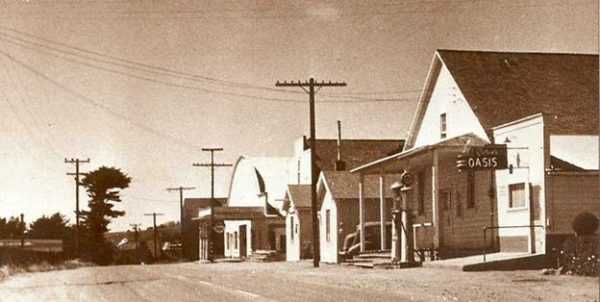 Chuck Ross, his brother John and his sister Lorene Christiansen have both been officers in the Mendocino County Historical Society. Chuck grew up in Elk and has had a lifelong interest in the lumber industry there, and especially in the railroads. Over the decades Chuck has walked nearly every mile of the railroads in Greenwood, Elk and Alder Creeks. He has even walked some stretches where the rail is still in place. These two maps were provided by Chuck. 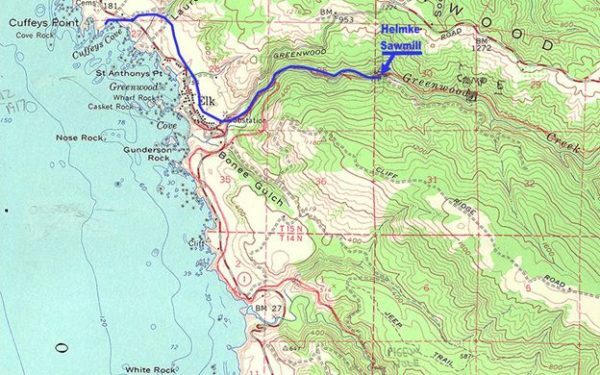 The blue line shows the approximate rail route from Cuffey’s Cove to the Fred Helmke sawmill and camp – the first sawmill at Greenwood. The route was a nearly level run and Chuck would not be surprised to learn that horse-drawn cars had been used on it in the early days. The first destination out of town was the shingle mill in Laurel Gulch, then the tracks went on down to Greenwood Creek. The second map segment shows the location of the L.E. White sawmill near the mouth of the creek. The White addition to the trackages is shown in purple with the Helmke track now shown dashed. Sanborn maps show the connecter was abandoned between 1891 and 1894. No record exists to tell us where the first loco, “Sausalito”, came ashore. This entry was posted in Maps, Towns. Bookmark the permalink. Proudly powered by WordPress | Theme: Sunspot by WordPress.com.